Now may be a good time for the FOMC to consider allowing the balance sheet to shrink in nominal terms. What does Bullard have in mind when he speaks of a low-growth "regime?" 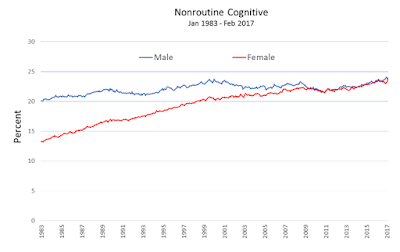 The usual way of interpreting development dynamics is that long-run growth is more or less stable and that deviations from this stable trend represent "cyclical" mean-reverting departures from trend. And if it's "cyclical," then it's temporary--we should be forecasting reversion to the mean in the near future--like the red forecasting lines in the picture below. This view of the world can lead to a series of embarrassing forecast errors. Since the end of the Great Recession, for example, you would have forecast several recoveries, none of which have materialized. But what if that's not the way growth happens? 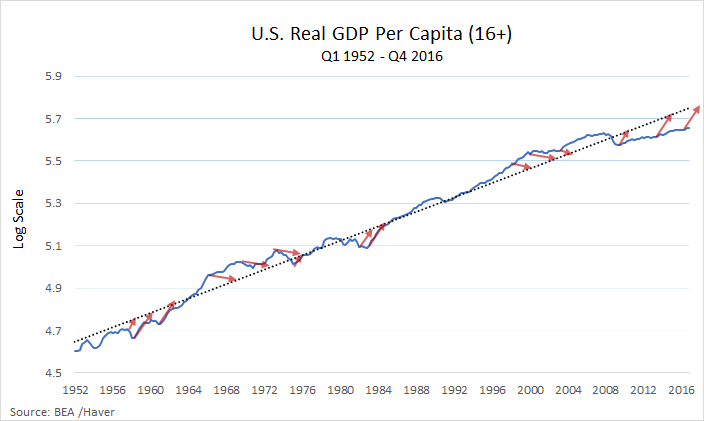 Suppose instead that growth occurs in decade-long spurts? Something like this. 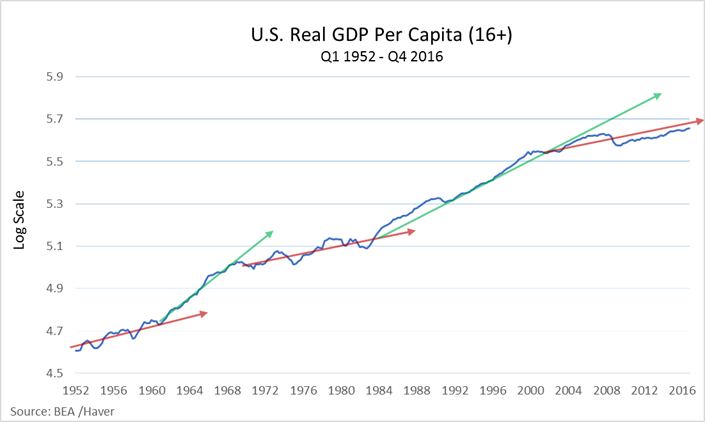 This view of the development process does not say we're presently stuck forever in a low-growth regime. It simply suggests that we have no idea when the economy will once again embark on a higher (or heaven-forbid, lower) growth regime and that in the meantime our best forecast is for continued low-growth for the foreseeable future. 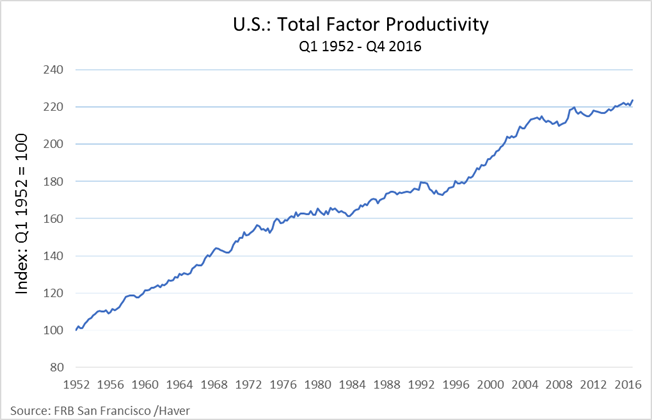 Note that the most recent productivity growth slowdown occurred well before the financial crisis. 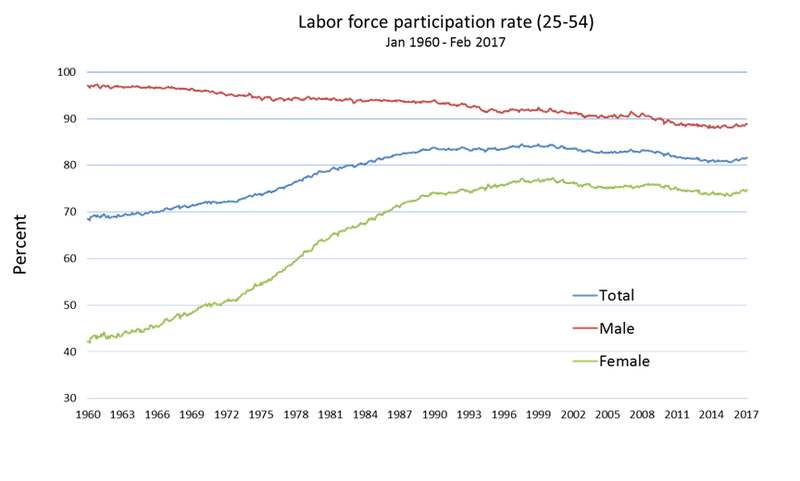 The notion that the economy has converged to a low-growth regime is also evident in a variety of labor market measures. 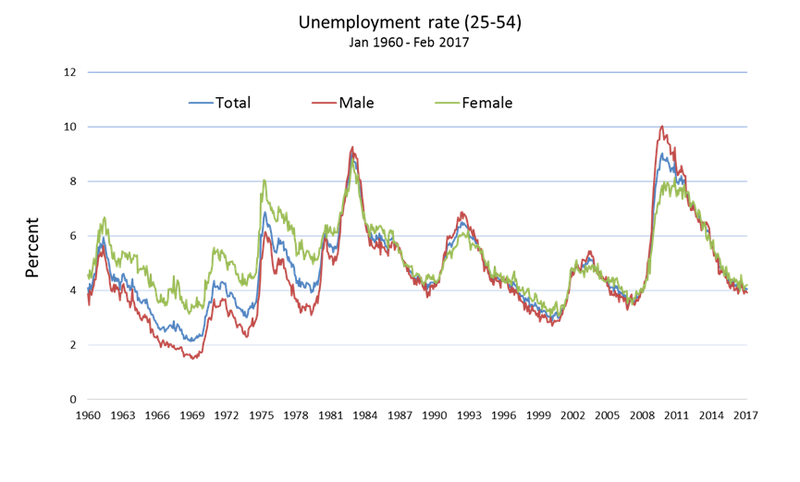 The prime-age unemployment rate is essentially back to its recent historical average, for example. 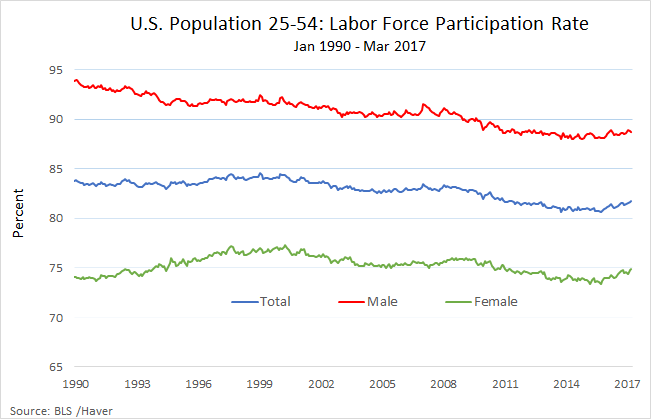 Measures of prime-age employment and participation still have a way to go, but arguably not very much. Next, what does he have in mind when he speaks of a "low-safe-real-interest-rate regime?" Bullard associates the "safe-real-interest-rate" with the expected real rate of return on (nominally) safe U.S. treasury debt (which he labels "r-dagger"). Operationally, he uses the one-year U.S. treasury yield minus a measure of year-over-year inflation (e.g., the Dallas trimmed-mean inflation). Below I plot "r-dagger" using year-over-year PCE inflation. 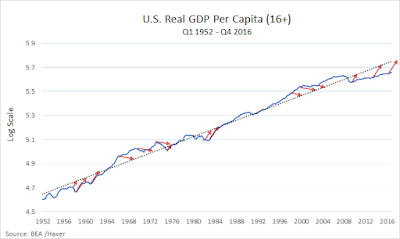 I also plot an hypothetical "r-star" interest rate which (as suggested by theory) should track the expected growth rate of real per capita consumption expenditure. 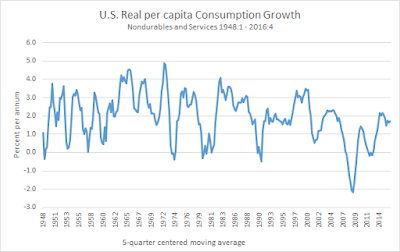 The (theoretical) real interest rate (as measured here by consumption growth)--the blue line--is on average high in high-growth regimes and low in low-growth regimes (the 1950s provide an exception). 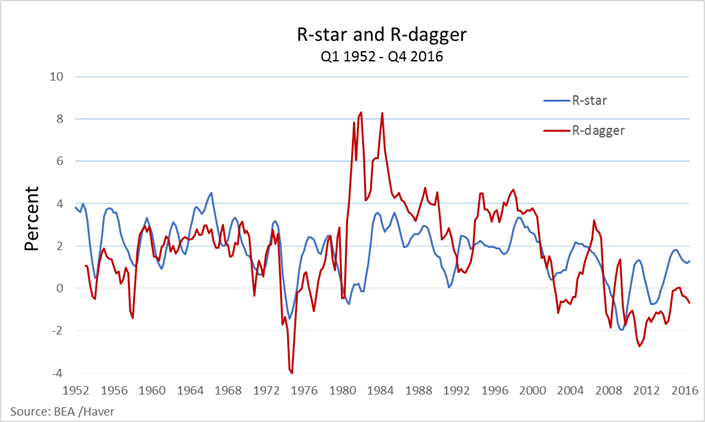 The r-dagger interest rate appears to move broadly with r-star (the early 1980s provide a dramatic exception). 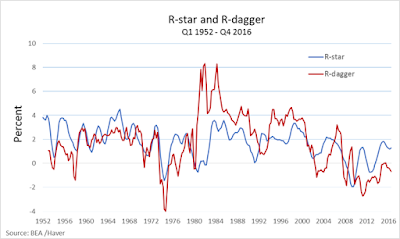 The gap between r-star and r-dagger could be interpreted as a risk-premium (or a liquidity premium). The secular decline in r-dagger since the early 1980s reflects a number of factors. Inflation expectations fell and became anchored under Volcker. And since at least 2000, there's been an ever-expanding global demand for safe assets which are used extensively as collateral in shadow banking, as safe stores of wealth in emerging economies, and as objects that fulfill growing regulatory requirements (Dodd-Frank and Basel III). Evidently, Bullard does not believe that the appetite for these safe assets is likely to dissipate any time soon. 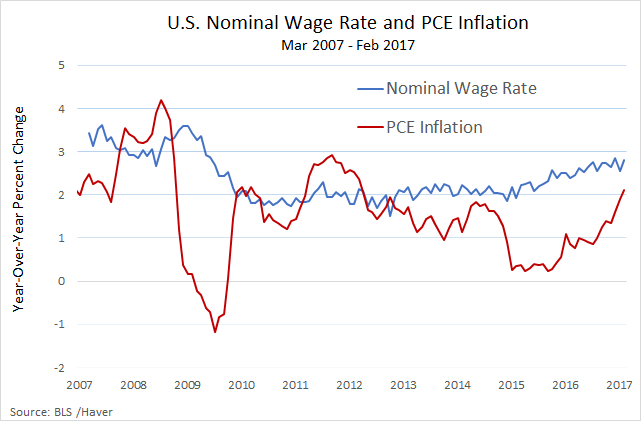 As for inflation, headline PCE inflation has only recently ticked back up close to the Fed's official 2% target. 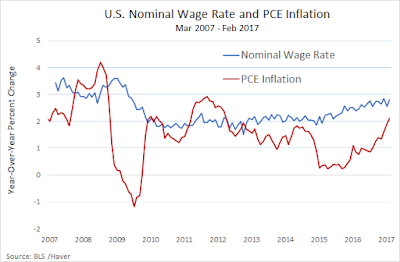 Nominal wage growth has also ticked up recently, but remains rather muted. 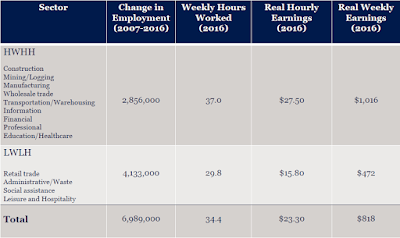 The growth in real wages remains low--which is consistent with the U.S. economy operating in a low-growth regime. Market-based measures of long-run inflation expectations appear well-anchored. 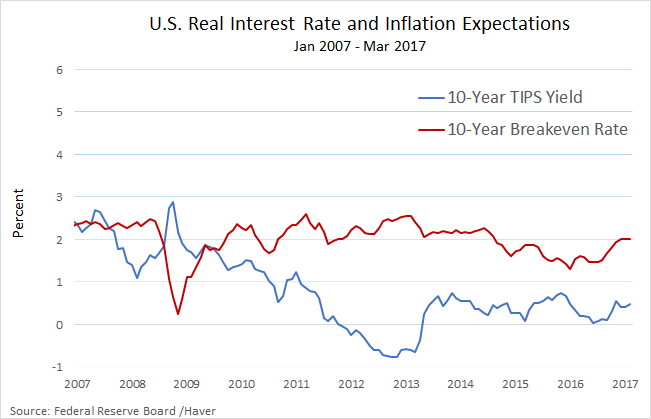 Below I plot the 10-year breakeven inflation rate (expected inflation 10 years out) and the real yield on the 10-year U.S. treasury (blue line). Given these observations, what's the rush to raise the policy rate? At the same time, Bullard is suggesting that it might be a good time to think about reducing the size of the Fed's balance sheet. He notes that recent FOMC policy is putting upward pressure at the short end of the yield curve (via recent policy rate increases) at the same time putting downward pressure at the long end of the yield curve (via the long-term securities purchased in the LSAP). Bullard notes that "this type of twist operation does not appear to have theoretical basis." In fact, it's not clear what policy should aim for (if anything at all) in terms of influencing the slope of the yield curve. Nevertheless, there are some good reasons to shrink the balance sheet (I provide a reason for keeping it large here). First, if there is indeed a shortage of safe assets, why is the Fed buying them up (replacing them with reserves that only depository institutions can access directly)? Ending the reinvestment program would release additional safe assets for the market, the effect of which would be to increase yields on safe assets (a good thing to the extent higher yields represent diminished liquidity premia.) Second, ending reinvestment (especially in MBS) would be a good move politically. One concern about ending reinvestment seems centered around the possibility of creating another "taper tantrum" event. But it seems unlikely that disruption in the bond market would occur if the policy change is communicated clearly and with plenty of advance notice. The labor market is back to normal. Or so we are told. Here's the prime-age unemployment rate for the United States beginning in 1960. Above we see the familiar cyclical asymmetry, in which the unemployment rate spikes up sharply at the onset of a recession and declines gradually during the recovery. 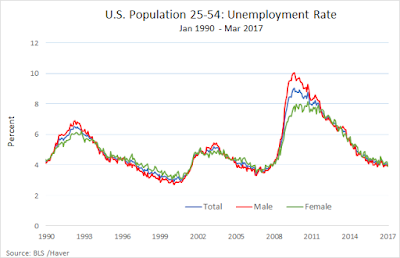 As of today, the prime-age unemployment rate is at 4%, close to its recent historical norm. Other measures of labor market activity, however, tell a slightly different story. 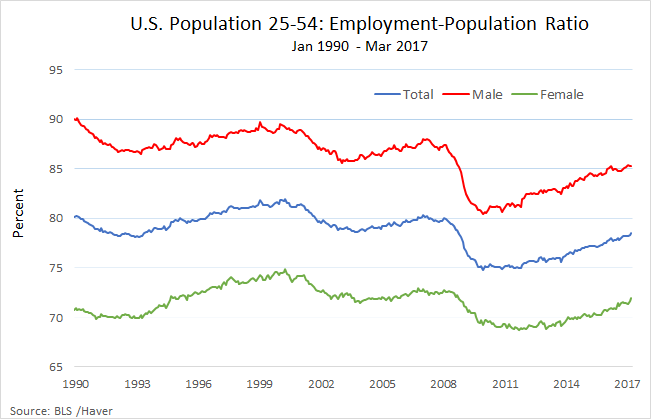 Here is the prime-age employment-to-population ratio. 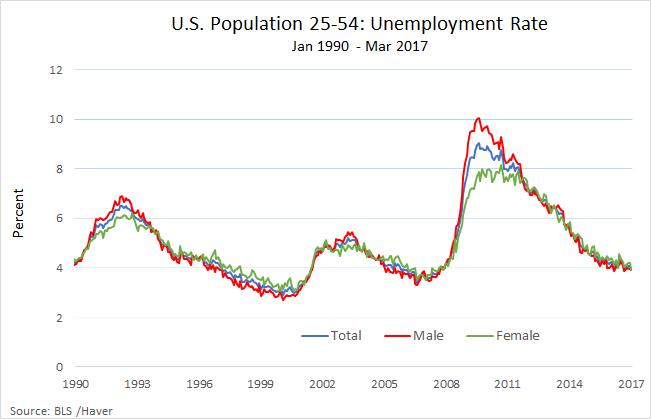 Employment took a big tumble during the recession--especially for males--and its taken a lot longer to recover than unemployment. In fact, we're not quite back to pre-recession average of about 80%. 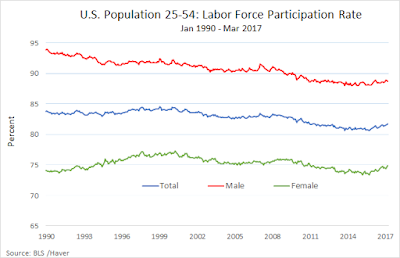 The reason employment has recovered more slowly than unemployment is because significant numbers of prime-age workers left the labor force in the aftermath of the Great Recession. This pattern has reversed only recently. By these standard measures of aggregate labor market activity, the U.S. labor market appears close to "full employment." Nevertheless, there is still much anxiety concerning the present state and future course of the U.S. labor market. Much of this anxiety stems from the perennial concerns regarding the impact of international trade and technology on future employment opportunities. To assess the nature of these concerns, we have to move beyond the standard aggregate measures of labor market activity, which have remained relatively stable since 1990 in the face of growing trade deficits and technological progress. 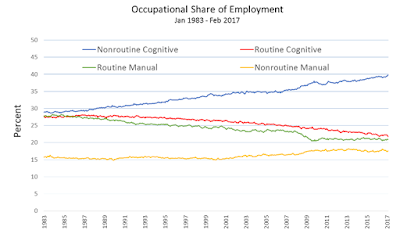 So if trade and technology are going to have an impact on employment opportunities, it's likely going to happen at the sectoral and/or occupational level. 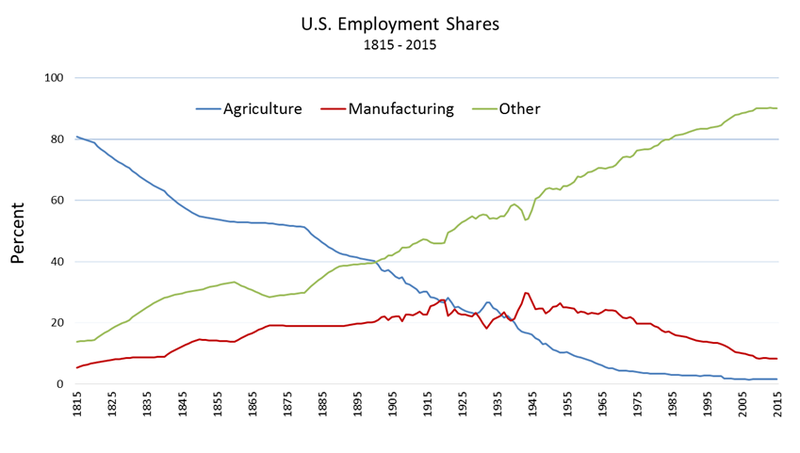 Of course, a changing allocation of human labor across sectors of the U.S. economy is nothing new. 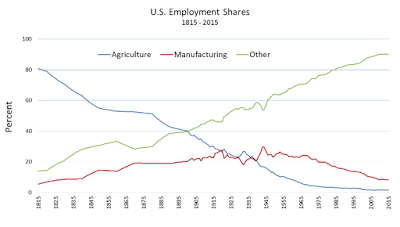 Here is the share of employment in agriculture and manufacturing since 1815. “It’s about the meanest business I have ever experienced. It’s all fact—solemn fact – no romance, no poetry, no joke. It does seem to me that all this sort of work ought to be done by machinery or not to be done at all.” Source: Farm Life at the Turn of the Century. As we can see, Smith got his wish. 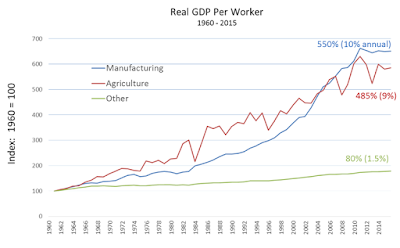 Over the centuries, machines have replaced most of human labor in the production of food. Was this a welcome development? Most of us today would likely answer in the affirmative. However, sectoral transformations like this also come at a cost, borne by those who are compelled to do the adjusting. A shovel that helps ease a manual burden is one thing. A combine harvester that renders a certain kind of labor redundant is another. When the demand for a certain type of labor in a given sector is diminished, what are workers to do? One thing they can do is employ their labor in the production of the machines that replaced their labor on the farm. 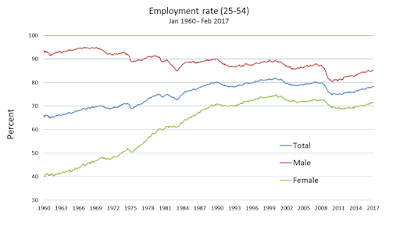 And so youngsters left the family farm and immigrants flowed increasingly into the communities that offered employment in manufacturing and other sectors. I'm not sure how much of an improvement it was to substitute the drudgery of farm work with the drudgery of factory work, but it was probably an improvement in net terms (however small). The relatively high levels of comfort most Americans enjoy today did not come about until the latter half of the 20th century. And by that time, manufacturing employment (as a share of total employment) began its long secular decline. 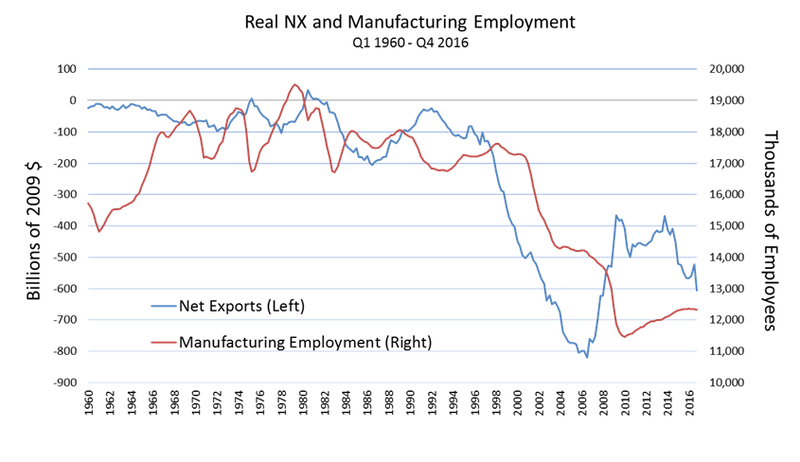 So, what accounts for the decline in manufacturing sector employment? According to Dean Baker, the U.S. trade deficit has a lot to do with it. 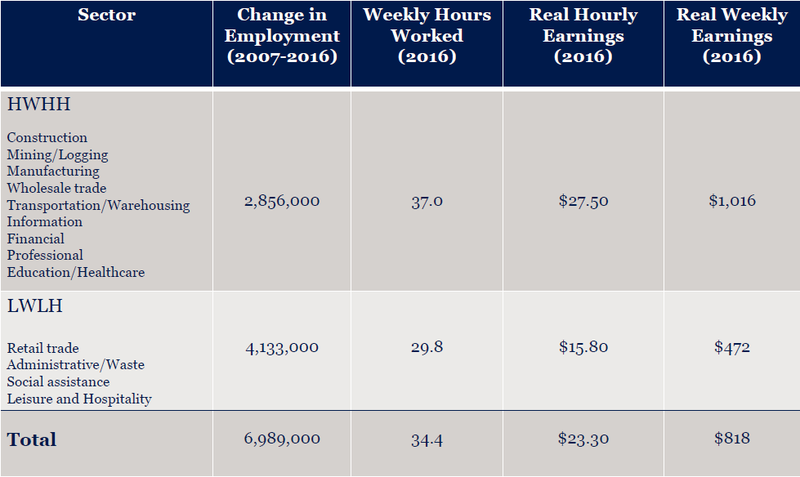 Since 2000, employment in the U.S. manufacturing sector has dropped from about 17 million to 12 million workers. The sharp decline started with the "China shock" in 2001 (also a recession year). On the other hand, Germany has also experienced a decline in manufacturing sector employment while running trade surpluses. Arguably, the trade surpluses muted the secular decline in manufacturing employment in Germany, while the U.S. trade deficits exacerbated the process of structural readjustment. 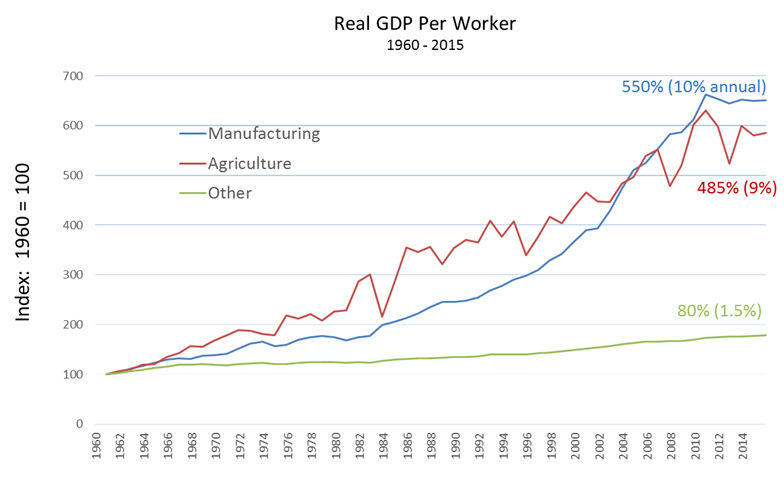 The trade deficit has almost surely had some impact on U.S. manufacturing employment, but it's hard for me to escape the conclusion that most of the sectoral reallocation of labor has been driven by technology. The next diagram tells the story. But it hardly matters to an individual worker whether they are displaced by a foreigner or an automaton. 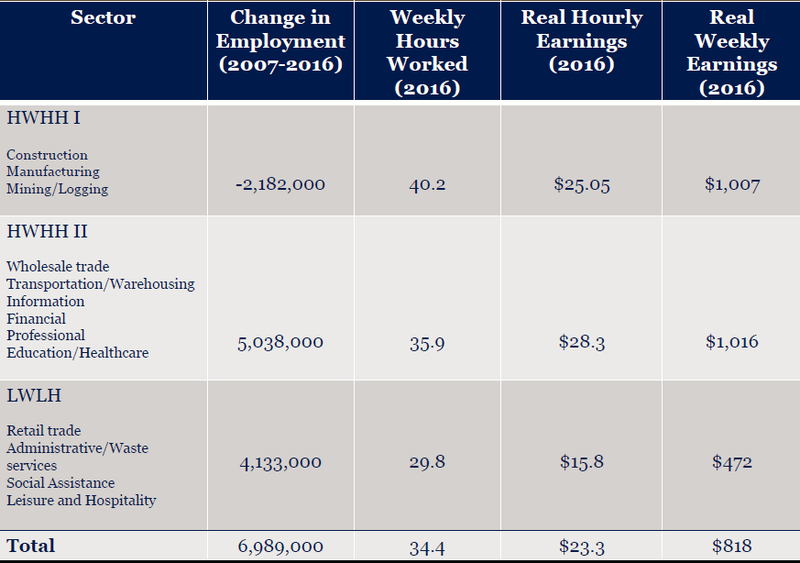 Where are the new jobs to be found and what are they paying? 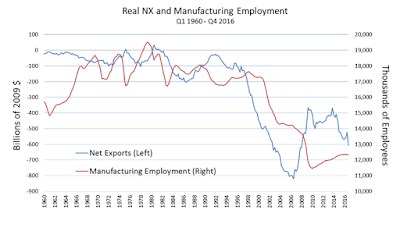 Are all of our good, high-paying manufacturing jobs being replaced by lousy low-paying service sector jobs? There is an element of truth to this. As Daniel Alpert points out, since the cyclical peak in 2007, the U.S. economy has added close to 7 million jobs. 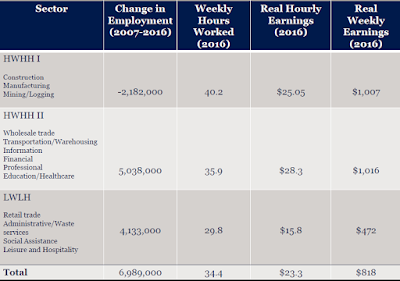 About 60% of these jobs appeared in the "low-wage, low-hours" sectors that account for about 36% of all private sector jobs; see table below. The picture is not quite as bleak as Alpert paints it. Andrew Spewak (my trusty RA) took it upon himself to produce this table. 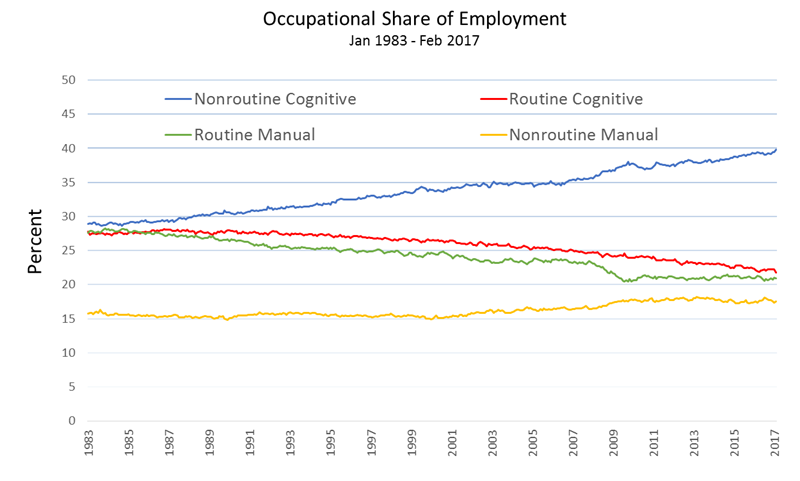 What this decomposition shows is that there is in fact substantial net job creation in high-wage/high-hour jobs in the service sector. The bleakness is heavily concentrated in manufacturing (which we know is in secular decline) and in construction (which is not in secular decline, but which hit a peak just prior to the housing crisis). 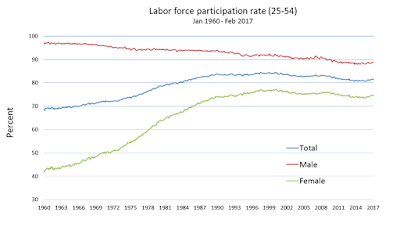 Let's dig a little deeper and explore the task-based view of the labor market developed by Daron Acemoglu and David Autor (see here). 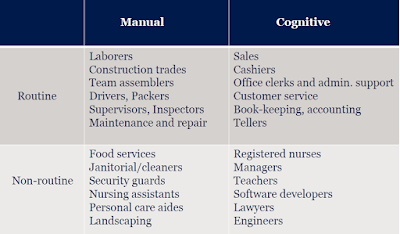 According to this view, goods and services are produced by a set of tasks that can be performed by various inputs, like capital and labor. Tasks differ along two important dimensions. The first dimension measures the relative importance of "brains v. brawn" in performing a task. 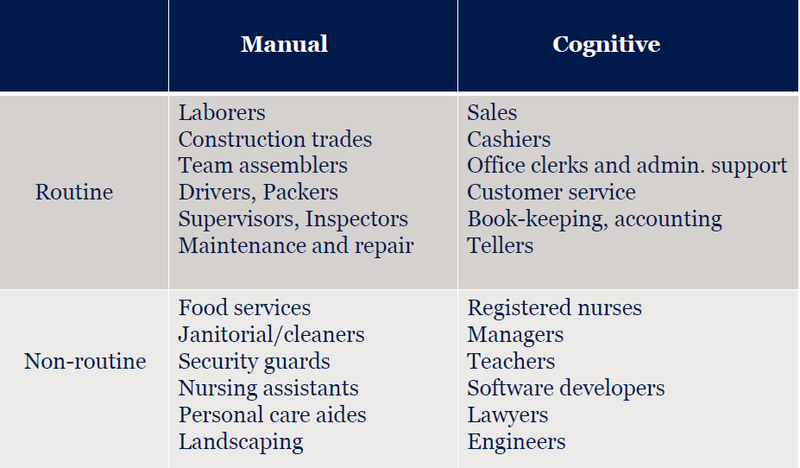 This is labeled "manual" v. "cognitive" in their analysis. The second dimension measures the extent to which a task can be described by a set of well-defined instructions and procedures. If it is, then it is possible to have an automaton execute a program to perform the task. 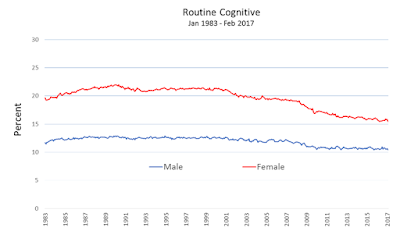 Acemoglu and Autor label these "routine" tasks. 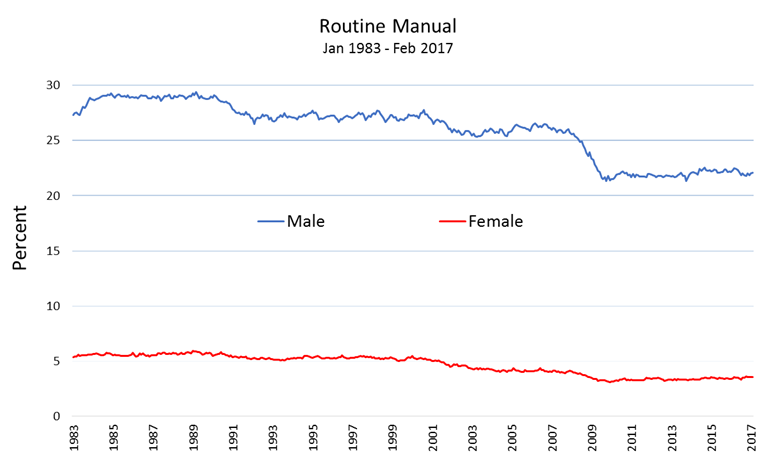 If instead the job requires ﬂexibility, creativity, on-the-fly problem-solving, or human interaction skills, the occupation is labeled "non-routine." 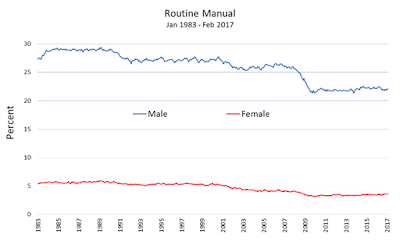 The decline of routine labor has been associated with "polarization"--that is, a "hollowing out" of America's middle class. 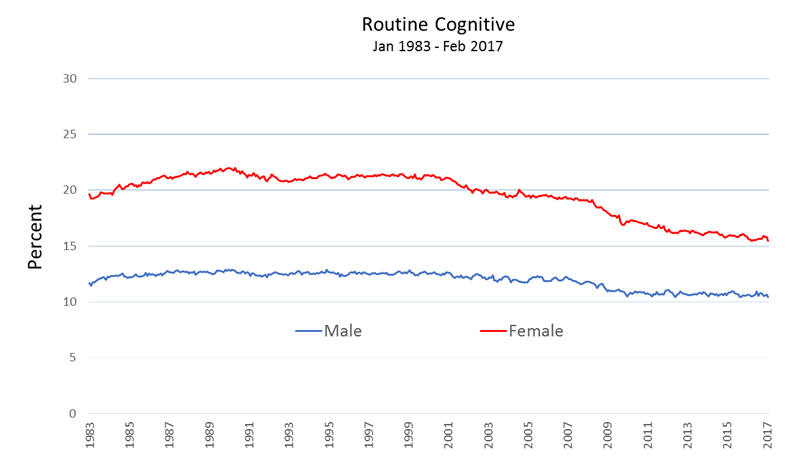 This is because routine jobs, whether manual or cognitive, generally pay "middle class" wages. 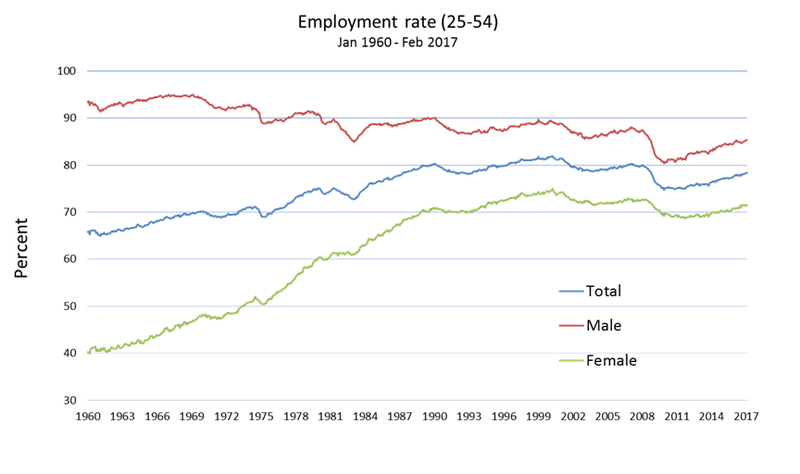 The share of employment allocated to these middle class jobs is declining. Where is this middle class going? 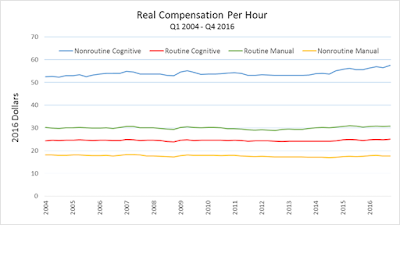 Largely to jobs in higher wage category, associated with non-routine/cognitive occupations. 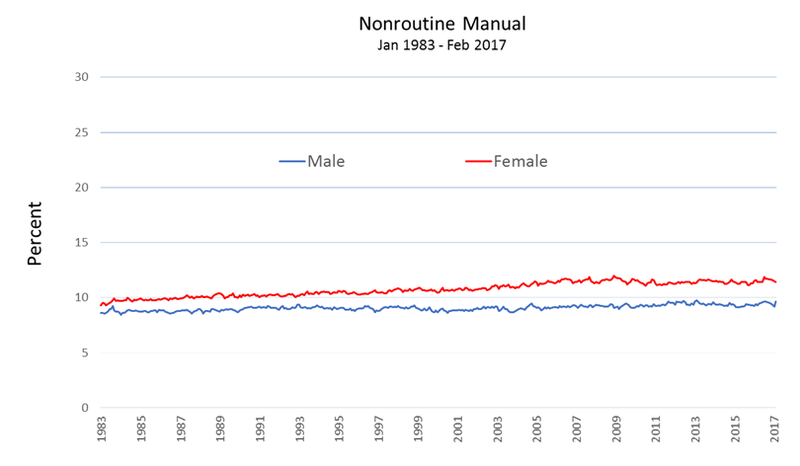 But there's also a moderate increase in the share of employment in the lowest wage category, in those jobs associated with non-routine/manual occupations. This is already a long post, so I don't really have space to ponder the question of Whither Human Labor? 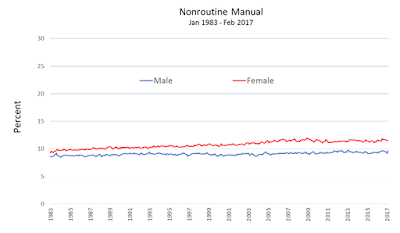 It seems likely that an increasing number of tasks presently labeled non-routine will become routine (still lot's of room in manufacturing it seems, see here). 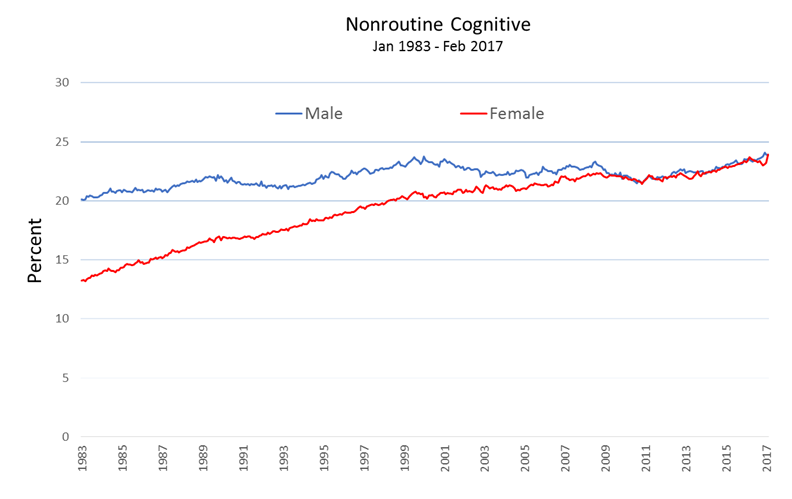 We have seen this with robo-advisors in the financial sector and the emergence of artificially-intelligent doctor apps (see here) among many other places. How might the future unfold? Here's one take, by Andrew McAfee: Are Droids Taking Our Jobs? 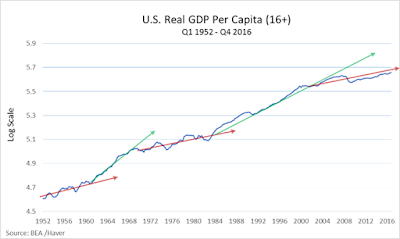 The Economy May Be Stuck in a Near-Zero World (Justin Wolfers). Justin does a good job describing how many economists view the role of monetary and fiscal policy in the post Great Recession world of low interest rates and low inflation. I am curious to know where I agree and disagree with what he says. So, here goes. 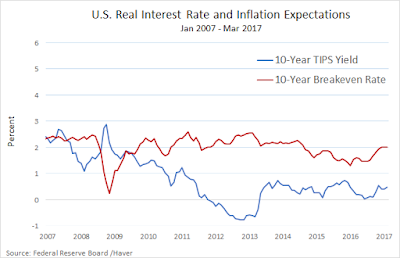 [T]he real (inflation-adjusted) interest rate consistent with the economy operating at its full potential has fallen...from around 2.5 percent to 1 percent, or lower. I think this is true. 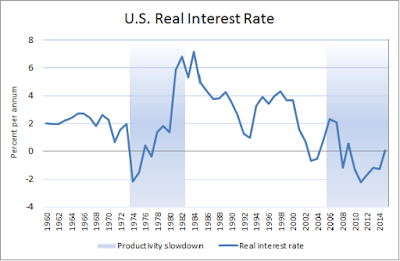 I also do not think it's surprising that the "natural rate of interest" (r*) fluctuates and that its trend path may shift over time. Indeed, I'd be surprised to learn this was not the case. 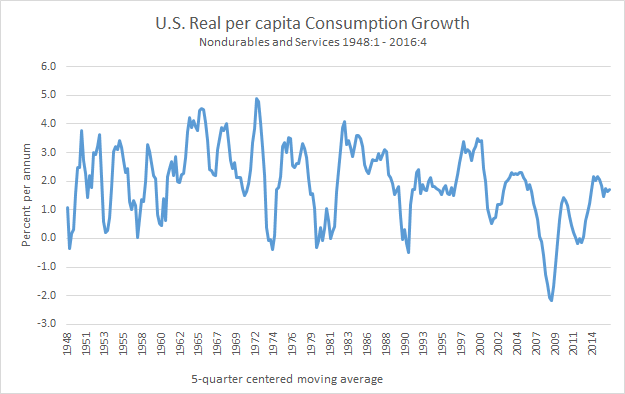 According to standard macroeconomic theory, r* should follow the trend in consumption growth. The basic idea is simple. If the economy is expected to grow rapidly, people will want to save less (or borrow against their higher future income) in order to smooth their consumption. Collectively, their efforts to consume more and save less puts upward pressure on the real interest rate. The converse holds true if pessimism reigns: people will want to save more, to make provisions against a bleak future. Collectively, the effect is to depress the real interest rate. If you're trained in the art of haruspicy, as most of us appear to be, then you'll divine all sorts of patterns from the picture above. 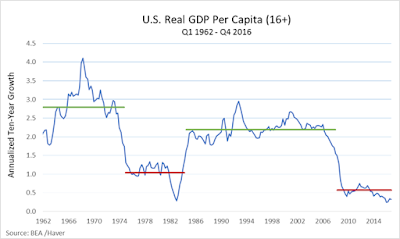 You might see a 2 percent trend growth rate with a break down to 1 percent (or lower) in either 2000 or 2007. 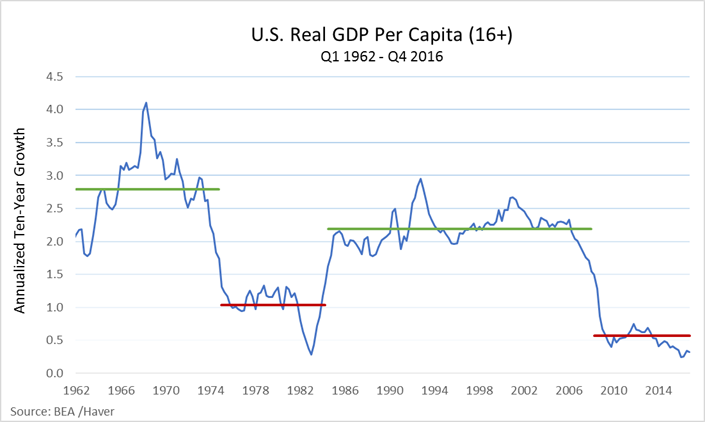 You might even detect a decade-long era of low growth in the 1970s. In "normal times," the nominal interest rate -- the neutral interest rate plus inflation -- has fallen from around 6 percent to 3 percent. That creates a serious problem for the Fed. Here's why: Most recessions can be cured by lowering rates by several percentage points. When interest rates were closer to 6 percent, the Fed could lift the economy with plenty of leeway. This is textbook stuff, which is not the same thing as saying it's correct. My own view on the matter (which is not necessarily correct either) is that the Fed is largely constrained to follow what the market "wants" in the way of real interest rates. It's not that the Fed "cures" a recession by lowering its policy rate -- the Fed is accommodating market forces that would have driven the real interest rate lower even in the absence of a central bank. Rightly or wrongly, the Fed acts to "smooth" these interest rate adjustments in the short-run. But at the end of the day, the trend path of r* is beyond the control of the Fed. Yes, but what if r* is so low that the effective zero lower bound (ZLB) on the short-term nominal interest rate (the Fed's policy rate) prevents the Fed from accommodating what the market wants? With 2 percent inflation, the real interest rate can only decline to -2%. What if that's not low enough? 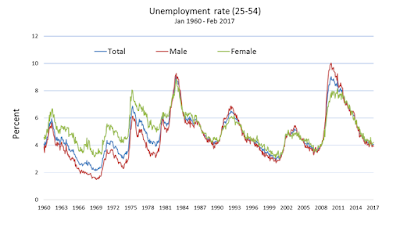 Then something else has to give--for example, the unemployment rate will rise and remain elevated for as long as this unfortunate situation persists--a secular stagnation. Perhaps the answer lies outside the Fed. 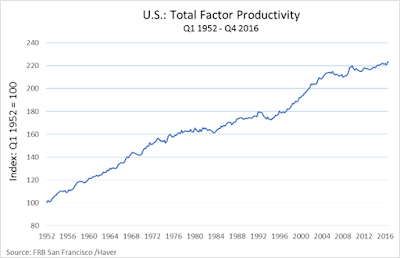 It may be time to revive a more active role for fiscal policy--government spending and taxation--so that the government fills in for the missing stimulus when the Fed can't cut rates any further. Given political realities, this may be best achieved by building in stronger automatic stabilizers, mechanisms to increase spending in bad times, without requiring Congressional action. In this spirit, Justin recommends a mechanism that automatically increases funding for infrastructure programs when economic growth slows. I personally don't think this is a terrible idea. (Though, I'd rather that infrastructure be geared more to long-term needs.) But no doubt it's probably easier said than done. Sometimes though, when I sit back and reflect on this line of thinking, it strikes me as rather odd in a couple of respects. First, is the ZLB really a significant economic problem? If it is, then why not abolish it as recommended by Miles Kimball? Would permitting significantly negative real rates of interest solve our problems? I don't think so. I'm inclined to think of a low r* as symptomatic of more fundamental economic forces. And eliminating any (real or perceived) gap between the market interest rate and r* is probably small potatoes (see here). Second, I think the world has indeed changed for discretionary monetary and fiscal policy, but in a way that almost no one talks about. Quite apart from any possible changes in r* (which we cannot measure), the real rate of return on U.S. Treasury (UST) debt--what my boss James Bullard calls "r-dagger"--has been declining for over 30 years (diagram taken from here). One interpretation of this pattern is that USTs were initially a flight-to-safety vehicle with the disruptions that occurred in the early 1970s (so real yields declined). With the breakdown of Bretton Woods and fiscal pressures (Vietnam war, War on Poverty, etc. ), however, inflation became un-anchored. The high real yield on nominal UST debt reflected a growing inflation-risk premium in the early 1980s (when inflation was high and volatile). Subsequently, as inflation declined and inflation expectations became anchored (thanks to Volcker and a terrible recession) the inflation risk premium declined over time. Since about 2000, a China trade shock and other factors led to a growing world demand for USDs and USTs. R-dagger (r+) remains extremely low even today--reflecting the "liquidity premium" that the market now attaches to UST debt. Moreover, the distinction between USDs and USTs is much diminished in financial markets. In the old days, when the Fed wanted to move interest rates through an open-market swap of USD for UST, it meant something. But today, it means almost nothing, since interest-bearing reserves are a very close substitute for interest-bearing treasuries. In short, U.S. treasury debt is essentially "money" as far as financial markets are concerned (USTs circulate as such in repo markets, for example). The implication of all this for monetary and fiscal policy is quite interesting. The fact that the yield on USTs is less than (our estimate of) the natural rate of interest suggests that the policy rate is presently too low -- not too high (as is suggested by standard ZLB concerns). The most direct way to raise interest rates (i.e., eliminate the liquidity premium on USTs) is for the U.S. treasury to issue debt at a faster pace. One way to do this is through Justin's automatic infrastructure funding plan that kicks in when liquidity premia on USTs are elevated (bond yields are low). Another way is to have automatic (temporary) tax cuts kick in. Yet another way (though far less desirable) is to have the Fed increase the interest in pays on reserves. Politically this is dynamite, but from an economic perspective, it forces (ceteris paribus) the treasury to issue debt at a faster pace (because it lowers Fed remittances to the treasury). Yet another way is to have the Fed sell some of its treasury holdings (since treasuries are sometimes more liquid than reserves in financial markets--i.e., only depository institutions have direct access to reserves). Depending on which view one adopts, the recommended Fed policy action matters a great deal (at least, in principle, if not quantitatively). If the interest rate is too high (ZLB view), then it should be lowered, or the inflation target raised. If the interest rate is too low (liquidity premium view), then it should be raised, through asset sales or some other mechanism. On the other hand, the recommended Treasury policy action seems robust across the two views: the treasury should expand its debt at a faster pace (via tax cuts or increased spending, or some combination). This seems like a promising development from the perspective of competing theories. If a policy recommendation follows from many different perspectives, we become more comfortable with the idea of actually implement them. Of course, there are some caveats to consider, which I discuss here. But enough for today.